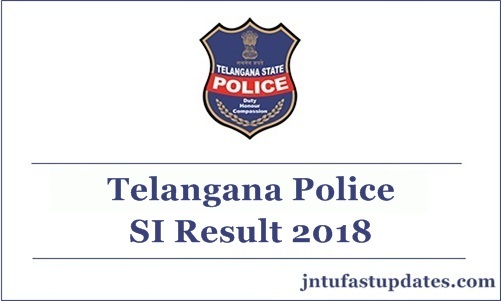 Telangana Police SI Results 2018 :Telangana State Level Police Recruitment Board (TSLPRB) written test round was completed On 26th August across various centers of Telangana. Competitors seeking to become Police Sub-inspector in the state of Telangana have competed for the written test round. Aspirants have competed in thousands of numbers for the Telangana Police Sub-inspector examination. The organization has released the TS Police SI answer keys after the completion of the tests. Now, the aspirants waiting to check Telangana Police SI result from below. The result, cutoff marks, and merit list will be shortly accessible on TSLPRB official website, tslprb.in. Competitors can stay checking the Telangana State Police Department official website to check the updates. Candidates appearing for Preliminary Written Test was 1,88,482. The Preliminary Written Test for the Recruitment of SCT SIs Civil and / or equivalent Posts has been conducted throughout the State from 10 am to 1 pm, today (26-08-2018). This test was conducted in 339 Examination Centres, in Hyderabad and District Headquarters towns of the erstwhile districts in Telangana. 1,78,010 Candidates has been attended for preliminary test conducted on sunday. Telangana State Level Police Recruitment Board (TSLPRB) has announced the notification for 1272 Sub-inspector posts recently. The department has released the notification on 31st May. TS Police SI application process was started from 9th June and lasted till 30th June. A large number of candidates wishing to become police SI in the Telangana state have applied for the announced posts during application dates. The TS Police Department is going to shortlist the aspirants by conducting the few tests such as physical eligibility test, physical standards test, written test (Preliminary and Mains), and interview rounds. Candidates clearing all these rounds will be essentially taken into consideration for appointment. The Telangana Police Department has conducted the written test round in the months of August/September. Hopefuls competed for the examination can check the results, cutoff marks, and merit list shortly. Exam Conducting Board Name Telangana State Level Police Recruitment Board (TSLPRB). Job Designation Sub Inspector, SPAF. No. of vacancies 1272 Posts. Application starting date 9th June 2018. Application ending date 30th June 2018. Hall Ticket available date 16th August 2018. The competitors who have come across the test have to initially qualify the written test round to shortlist for the further rounds of selection process. physical ability tests which include physical measurement test will be conducted for the aspirants qualified the written test round. Candidates who qualify the endurance test and physical efficiency test, various reservations rules of the authority will finally get the chance to work as Sub-inspector of police in the state of Telangana. Official ts Police sub inspector cutoff marks released at the time of results announcement. Candidates who have appeared for the Telangana SI written test can expect results after 3-4 weeks of the examination. finally it has been released on 16th September. Most probably, the Telangana Police Department is announced the results. Candidates can keep visiting the TSLPRB official website, tslprb.in to download the results. Along with the results, the organization will reveal the cutoff marks and merit list of the corresponding examination. Aspirants have to wait until the organization announces the exact result date. Keep checking the official portal on a frequent basis to know more updates. How to Check TSLPRB Police SI Results 2018 Online? Click on TSLPRB Police SI results. The Telangana Police Results will appear on the screen. Sir early polls effect these selection process ?? 30th Sep ko constable ka xam hai na.try that.did u apply for constable? Sir its tooo late ra result. don't apply for govt jobs if u don't have patience. If there is any chance of adding marks ,for mistakes in prilims question paper….give reply..sir…. Please release SI prelims results as soon as possible plz zzz zzz r else announce result date….! Plz release results sir or else please let us know exact date result.